miniaim is a tiny (81 k) AOL Instant Messaging client written in C++ and using The TOC 2.0 protocol. miniaim only uses the Win32 API that gives it its small size. miniaim is compressed with the UPX compressor. 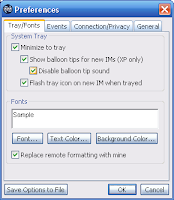 miniaim has all features of the regular AIM client.